Iris pseudacorus, also named the Yellow Flag and Pale Yellow Iris, is native to Europe, North Africa and the Mediterranean region. Iris pseudacorus is a perennial reaching 2-3 feet tall. The slender branching stems, as long as the leaves, bear 3-5 pale to deep yellow flowers 4 inches across. The flowers have 3 large downward-spreading sepals and 3 smaller erect petals; on each flower sepal are patterns of delicate light-brownish to purple veins or flecks. 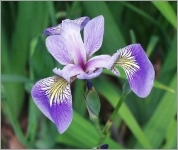 Iris pseudacorus is flowering in early Spring in the South (Florida) and in Summer in the North (Canada). It is a tall plant with long, dark green, flattened, sword-like leaves, arising in a fan from the soil. Its leaves sometimes die back over Winter, but persist if Winters are mild. Fruit a capsule, seed pod, large to 4-8 cm, glossy green. The plant spreads by means of its modified stems, rhizomes, which are located below the soil surface.